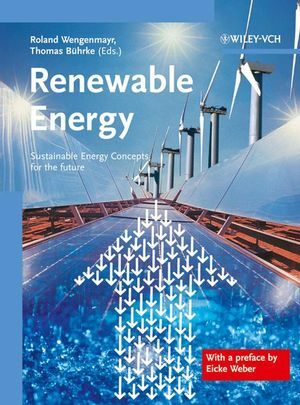 This translation of a German title, which was enthusiastically received by a wide audience, collects contributions by leading and well-known scientists in the area explaining the technical basics of photovoltaic, solar thermal energy, wind and water power as well as geothermal energy. In an easily accessible yet sober way, the book offers a solid overview of the possibilities offered by environmentally friendly techniques, energy conversion, storage, and transportation, discussing the topic without any misplaced ideology. The editors are experienced journalists and illustrate the text with simple diagrams and information boxes, printed in full-color throughout. For applied physicists, engineers in power technology, engineers, and anyone interested in natural sciences. Roland Wengenmayr is science journalist and editor of the journal "Physik in unserer Zeit". He studied physics in Darmstadt, with a temporary stay at the European research laboratory CERN in Geneva. After the diploma he worked as an engineer in the chemical plant construction then he moved on to the publishing house Wiley-VCH, where he worked as commissioning editor for physics and physical chemistry. Today he writes for prominent newspapers on topics like e.g. renewable energy. Thomas Bührke is science journalist, editor of the journal "Physik in unserer Zeit", and author of several popular science books within the ranges of physics and astrophysics. He studied Physics at the universities of Göttingen and Heidelberg and attained there a doctorate at the Max-Planck Institute for Astronomy. Subsequently, he changed to the publishing house Wiley VCH, where he started as an editor of the journal "Physikalischen Blätter" (now: "Physik Journal") and later changed to "Physik in unserer Zeit".